Compared to the other motorhomes on our list the Monaco 44 SIG Premier is considerably cheap as it costs around $225,000. However, you do get your money’s worth as this motorhome can sleep six people, and includes a turbo diesel engine, 10 air bags, aluminium wheels, leather powered pilot and co-pilot seats, and LCD televisions in both the bedroom and lounge! 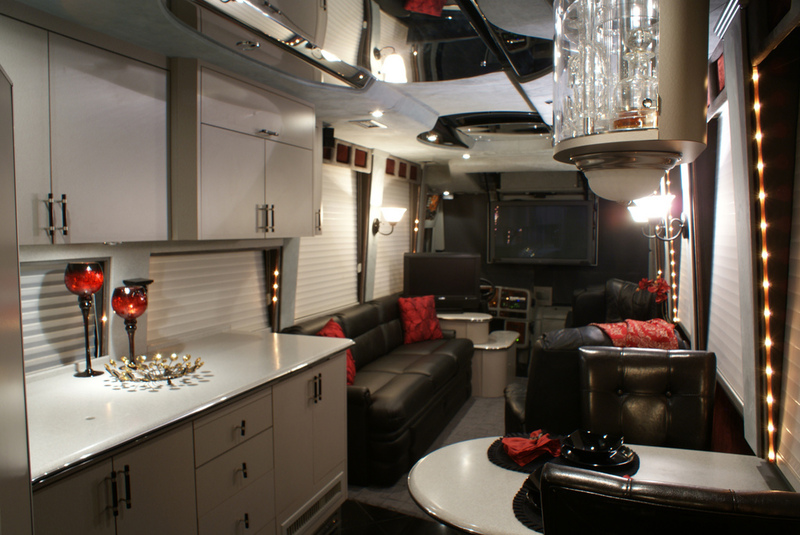 Next up is the Country Coach Prevost RV which you can buy for $1.3 million and includes a King size bed, bedroom, living room, bathroom and kitchen, and even comes with a barbeque option. This RV also boasts the fact that even with all the added luxuries it is still a semi-off road vehicle, and is made with a combination of a stainless steel and high tensile steel integral frame. There is also a three speed engine cooling fan installed which we’re sure comes in handy when trying to take this massive RV off-roading! It is highly unlikely that you will see one of these motorhomes parked up at your local caravan site – in fact it’s highly unlikely that you will ever see this motorhome at all due to its whopping price tag of $2.5 million. Not only is this motorhome massive inside but is also made out of some of the most expensive materials in the world, such as the Inca marble entry steps, and the stair risers which are created out of hand-made glass tile embedded with copper. Furthermore, the Vantare Platinum boasts Sub-Zero appliances, a room with a Plasma TV and a King bed, and a sports car garage under the deck. We’re not sure how much the motorhome insurance on this model would be but we’re pretty sure it would be well into the hundreds of thousands! Spending millions of pounds on a motorhome may sound crazy to some, however we love the fact that these motorhomes were manufactured as they are great fun and something we’re sure that most motorhome enthusiasts would love to see!